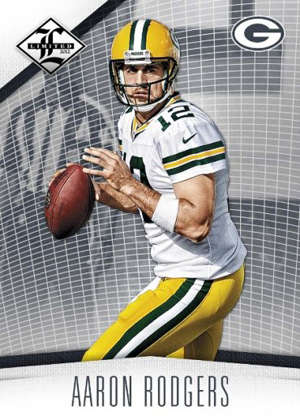 Living up to its name, 2012 Panini Limited Football comes with a low supply. From autographs and memorabilia cards to inserts to base cards, everything in the product is numbered to 399 or less. Every single-pack box promises three hits including at least one autograph. Packs have seven total cards. 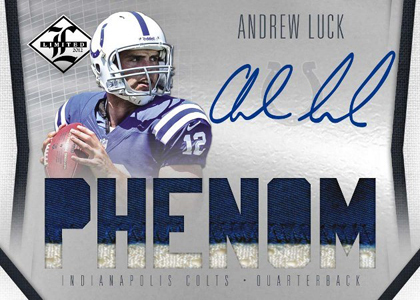 The 2012 Panini Limited Football set has 100 base cards, 50 Legends, 50 Phenoms rookie cards and 35 autographed Material Phenoms. The Hog Heaven name may be familiar to many collectors as the insert has roots from the mid-90s with Playoff. Making their Limited debut, the cards now have a piece of pigskin that is signed in silver. Inked is another autograph set. The checklist has both past and present stars. Limited Cuts is all about cut signatures. 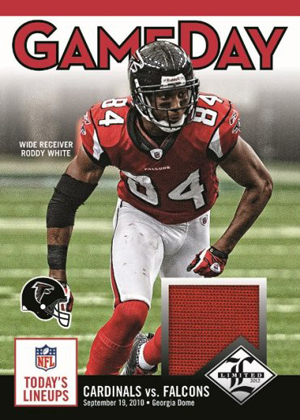 2012 Panini Limited Football also has a handful of memorabilia sets. Game Day Materials arrive with only premium game-used jersey swatches. The cards also note the exact game the jersey came from. Stadium Stars comes with game-used helmet pieces. Tag Team comes with memorabilia pieces from two different players. Tag Team also has parallel versions that come with either a laundry tag or an ID tag. 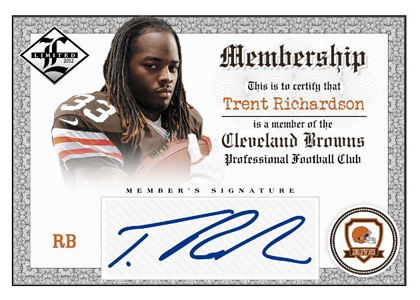 Good: On-card rookie autographs, fresh designs, all cards in product numbered to 399 or less. Bad: Players had live autographs for many previous 2012 products are now redemptions, base card checklist missing some key players that made an impact in 2012 while others that were benched or did not play often still appear. 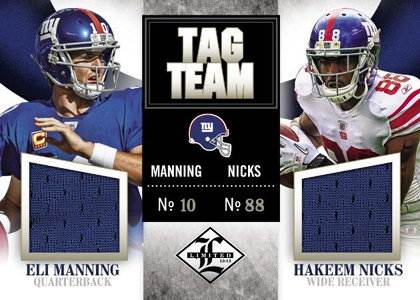 The Bottom Line: 2012 Panini Limited Football is focused on putting big hits in collectors' hands. It also provides a limited base set (#/399) that is in the price range of other meatier, more plentiful football products. It is, without a doubt, another staple in Panini America's yearly lineup that continues to evolve. At the same time, many elements from previous editions seep through. Streamlined and almost simplistic details let Panini's designers to really layout the many levels of autographed and memorabilia cards. Where the base cards and the rookie autographs on foil board literally shine, some of the inserts appear stale and dated. Notable inserts with strong designs are the Blue Chip, Monikers and Inked collections. Membership should be revoked. 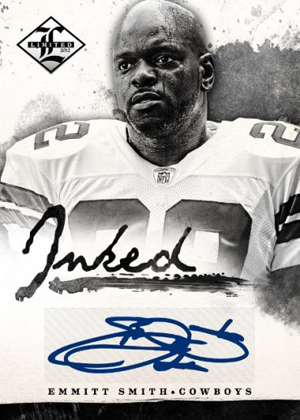 The 2012 Panini Limited Football checklist is large, boasting 235 cards including commons, legends, and rookies. Overall it encompasses several generations and will appease most collectors. Factor in the massive assortment of memorabilia and autographed parallels, and inserts, and you have a very solid mix to enjoy by the box, case or secondary market. The glaring omission of Colin Kaepernick this late in the season is something worth noting. With seven cards per box, the hope is to score big. Value in several 2012 products is in the eye of the beholder. With so many standout rookies in 2012, it is easy to asses value in their cards based on previous releases. 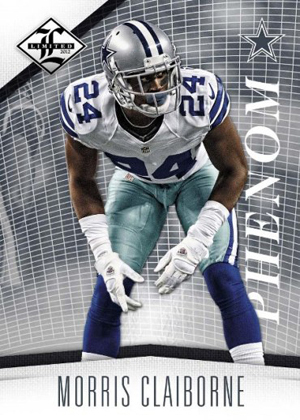 It is Limited's long list of rookie cards, and their low numbering that always seems to determine the long-term value of the brand. Some boxes will deliver immediate results while others will have collectors play the waiting game. If you are about cutting to the chase and just pulling low-numbered cards out of your pack without sorting a massive set, then the Limited will strike a chord with you. As you peel each of the seven total cards back, it is both thrilling and nerve-wracking at the same time. When a product can elicit that kind of feeling, you know it's going to be a blast to crack open. I just purchased this product yesterday. Overall, the cards are not overly too busy. Many new products tend to have a busy background which takes away from the main theme, The Player! Base cards are in good taste, the autos are not on-card. If it were on card, I would give it 5 stars. 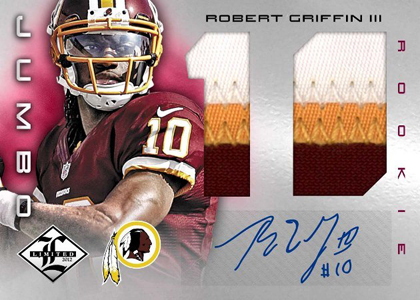 My hit was a RC 4c jumbo patch RGIII 12/49. I would recommend this product as well as purchase another box. I just bought a pack of this product yesterday and i was impressed of what i opened. My hit was 2012 Rookie Jumbo Jersey Prime Signatures NFL Shield (RG3) 1/1. Im fairly new at this hobby, I just started two weeks ago. I was just lucky i guess. Love this brand. Now i dont know what to do with this card now. Any suggestions? Jeff Ramos � If you really like the card, keep it. That said, if you were to sell it, you could go out and buy yourself a nice RG3 card and still likely have some many left over to either buy more cards or tuck away. Jeff Ramos � 1-of-1s are always tough to predict as there’s only one. You may want to list it with a high Buy It Now with the Best Offer option enabled. That way you can test the market and still protect yourself.